Organelles are distributed to daughter cells, via inheritance pathways. However, it is unclear whether there are mechanisms beyond inheritance, which ensure that organelles are present in all cells. Here we present the unexpected finding that the yeast vacuole plays a positive essential role in initiation of the cell-cycle. When inheritance fails, a new vacuole is generated. We show that this occurs prior to the next cell-cycle, and gain insight into this alternative pathway. Moreover, we find that a combination of a defect in inheritance with an acute block in the vacuole biogenesis results in the loss of a functional vacuole and a specific arrest of cells in early G1 phase. Furthermore, this role for the vacuole in cell-cycle progression requires an intact TORC1-SCH9 pathway that can only signal from a mature vacuole. These mechanisms may serve as a checkpoint for the presence of the vacuole/lysosome. Animals, fungi and other eukaryotes have cells that are divided into sub-compartments that are called organelles. Each type of organelle serves a specific purpose that is essential for the life of the cell. Yeast cells have a large organelle called a vacuole; the inside of the vacuole is acidic and contains enzymes that can break down other molecules. Previous studies have shown that when a budding yeast cell buds to produce a new daughter cell, a process ensures that some of the mother's vacuole is transferred to its daughter. However, yeast mutants that fail to inherit some of their mother's vacuole can still survive. This is because an ‘alternative’ mechanism allows the newly forming daughter to generate its own vacuole from scratch. Jin and Weisman now unexpectedly show that a new daughter cell cannot become a mother cell until its new vacuole is formed. The experiments made use of yeast mutants that were defective in the ‘inheritance’ mechanism, and double mutants that were defective in both the inheritance and alternative mechanisms. The experiments also revealed that a signal from the vacuole is required before the yeast cell's nucleus can start the cycle of events that lead to the cell dividing. Jin and Weisman suggest that this newly identified communication between the vacuole and the nucleus may help to ensure that critical organelles are present in all cells. Though it remains unclear why the yeast vacuole is critical for a cell to divide, these findings suggest that the mammalian lysosome (which is similar to the yeast vacuole) may perform a similar critical role in mammals. If this is the case, then understanding how these organelles communicate with the nucleus may provide new insights into how to prevent the uncontrolled growth of tumors and cancer. Organelles are essential for cellular functions, and organelle inheritance is likely a major pathway that ensures the presence of organelles in all cells. A requirement for the inheritance of the mammalian Golgi is well established due in part to the elaborate changes in architecture that occur during interphase vs mitosis (Shorter and Warren, 2002). For other organelles, which are constitutively dispersed, organized mechanisms for their inheritance remain less clear. 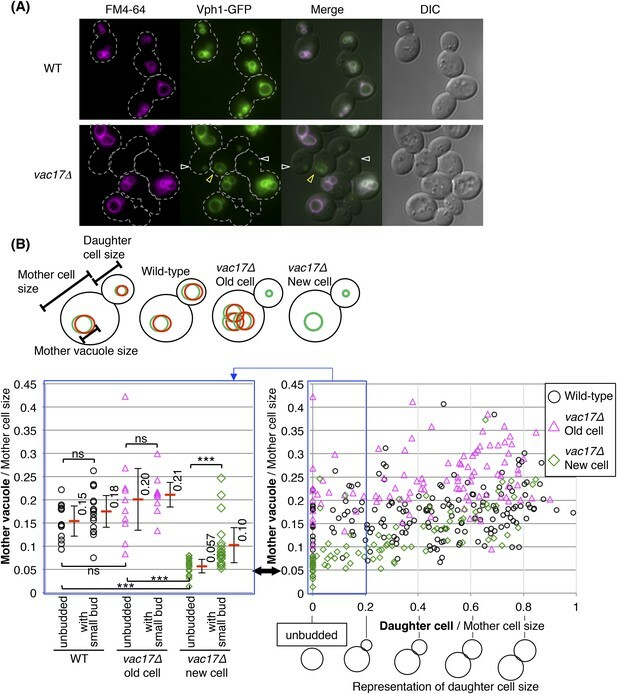 The budding yeast Saccharomyces cerevisiae provides an excellent model to study the spatial and temporal control of organelle inheritance, in part because its cell division is asymmetric. This asymmetric division requires active organelle transport in each cell-cycle. In budding yeast, most of the organelles are transmitted from mother to daughter cells (Fagarasanu and Rachubinski, 2007). These include the vacuole/lysosome, mitochondria, the endoplasmic reticulum, peroxisomes, secretory vesicles and late-Golgi elements. Transport of these organelles starts in G1 phase and occurs in coordination with the cell-cycle. However, it is unclear whether there are mechanisms that guarantee the presence of organelles prior to the next round of cell division. Here we present the unexpected finding that the presence of the vacuole is ensured because the vacuole plays an essential role in the initiation of the cell-cycle. During cell division in budding yeast, the daughter cell inherits a vacuole from the mother cell (Weisman et al., 1987). The vacuole is transported by a vacuole transport complex, composed of the myosin V motor Myo2, the vacuole membrane anchored protein Vac8, and an adaptor protein Vac17 that links Myo2 and Vac8 (Catlett and Weisman, 1998; Wang et al., 1998; Ishikawa et al., 2003; Tang et al., 2003). Vacuole inheritance is initiated in G1 phase via Cdk1/Cdc28, which regulates the formation of the vacuole transport complex (Peng and Weisman, 2008). After formation of the complex, Myo2 moves the vacuole to the daughter cell along actin cables (Hill et al., 1996). At the end of the cell-cycle, vacuole transport is terminated by ubiquitylation of Vac17, which is then degraded by the 26S proteasome (Yau et al., 2014). Notably, Myo2 also delivers other cargoes including mitochondria, peroxisomes, secretory vesicles, late-Golgi elements, and astral microtubules. Myo2 binds to each cargo via cargo specific adaptors, which attach to the globular tail domain of Myo2 (Yin et al., 2000; Itoh et al., 2002; Boldogh et al., 2004; Itoh et al., 2004; Fagarasanu et al., 2006; Arai et al., 2008; Lipatova et al., 2008; Jin et al., 2011; Santiago-Tirado et al., 2011; Eves et al., 2012; Chernyakov et al., 2013). Moreover, some of the regulatory pathways for vacuole transport are also utilized by other Myo2 cargoes (Moore and Miller, 2007; Peng and Weisman, 2008; Fagarasanu et al., 2009; Jin et al., 2009; Yau et al., 2014). Many of the proteins involved in vacuole inheritance are conserved among several species, which suggests that vacuole inheritance confers a selective advantage (Mast et al., 2012). These observations suggest that the vacuole plays essential roles. Surprisingly, mutations that block vacuole inheritance do not have a notable impact on cell viability (Catlett and Weisman, 1998; Ishikawa et al., 2003). Indeed, previous studies suggest that new vacuole synthesis occurs in the absence of vacuole inheritance (Weisman et al., 1990; Gomes De Mesquita et al., 1997), however at the time of those studies, there were no suitable methods to distinguish an old vacuole from newly formed vacuoles. Moreover the origin of the new vacuole was unknown. Importantly it was not clear how many pathways would need to be blocked in order to prevent vacuole biogenesis. Note that vacuole biogenesis utilizes at least three direct transport pathways: autophagy/Cvt (from the cytoplasm), AP-3/ALP (from the Golgi), and CPY (from the MVB/endosome) pathways (Bryant and Stevens, 1998; Hecht et al., 2014). To test when and where a new vacuole is generated in the absence of vacuole inheritance, we monitored for the presence of a vacuole using two markers, Vph1 and FM4-64. Vacuoles were detected using GFP fused to the integral vacuole membrane protein Vph1, a V0 subunit of the vacuolar ATPase (Manolson et al., 1992). 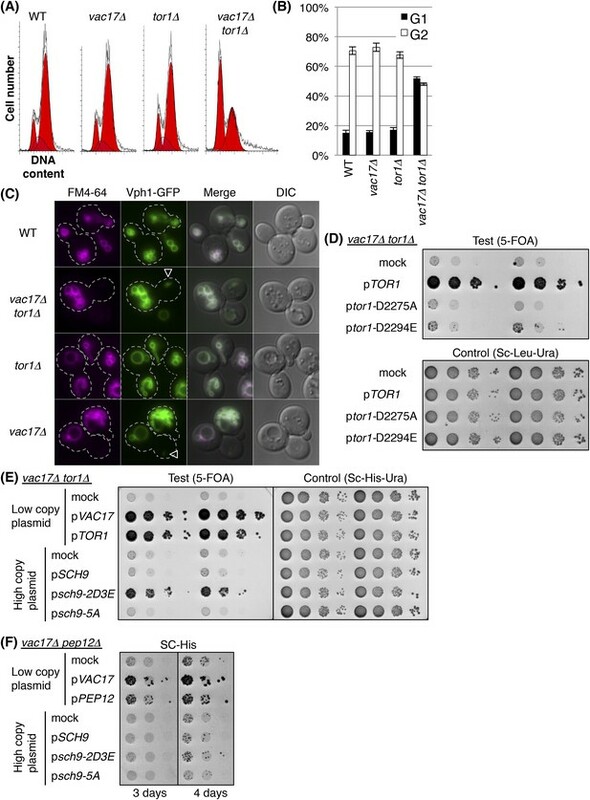 The presence of inherited vacuoles or old vacuoles were specifically assessed via pulse chase experiments with the vital fluorophore FM4-64 (Vida and Emr, 1995). Exogenously added FM4-64 binds to the plasma membrane, is internalized by endocytosis and delivered to the vacuole. After a chase of one doubling time, all of the FM4-64 is trapped on the vacuole membrane. In wild-type cells, the vacuole is inherited and FM4-64 is distributed between the mother and daughter vacuole (Wang et al., 1996), and Vph1-GFP and FM4-64 always colocalize (Figure 1A, top panels). In contrast, in the vacuole inheritance mutant vac17Δ, FM4-64 is retained in the mother cell (Ishikawa et al., 2003). Interestingly in vac17Δ, buds contained small Vph1-GFP positive vacuoles that lack FM4-64 (Figure 1A; open white allow heads, see also [Anand et al., 2009]). This observation indicates that there is new vacuole synthesis in the absence of vacuole inheritance, and that the new synthesis initiates in the bud. Yeast require vacuoles of a specific size prior to formation of a bud. (A) Wild-type and vac17Δcells which express Vph1-GFP from its endogenous locus, were pulse labeled with the vacuole specific dye FM4-64. Wild-type cells have both FM4-64 and Vph1-GFP signals in both mother and daughter cells. vac17Δ cells have both Vph1-GFP and FM4-64 on the vacuole in old mother cells, however the daughter cells solely have a Vph1-GFP labeled vacuole. White arrowheads; new vacuoles in daughter cells. Yellow arrowheads; new vacuoles in new mother cells. Dashed line; outline of cells. (B) (Left panel) A new cell does not form a bud until its vacuole reaches a specific size. Graph indicates the vacuole diameter of wild-type, vac17Δ old cell and vac17Δ new cells with no bud and mother cells with a small bud (less than 20% of diameter of the mother cell). Cell/vacuole diameter was measured by ImageJ. Each cell/vacuole diameter was normalized to its mother cell diameter. Black arrow; minimum size of mother vacuoles in cells with a bud. Average in each category (red bar). Error bar; standard deviation (SD). Not a significant difference; ns, p-value > 0.10. A statistically significant difference; *** (p-value < 1 × 10−3). (Right panel) The vacuoles of the new mother cells of vac17Δ grow faster than vacuoles in either a wild-type or vac17Δ old mother cell. Scatter plots of bud sizes and mother vacuole sizes. The new mother cells of vac17Δ, which lack FM4-64 (Figure 1A; open yellow arrowheads), had larger vacuoles compared to the newly formed vacuoles in the large buds. These findings suggest that the newly generated vacuoles continue to grow. To establish the relationship between the size of the newly formed vacuoles with the size of unbudded cells or mother cells, we measured vacuole size vs cell size in wild-type and vac17Δ cells. In wild-type cells, the vacuole diameter showed a linear relationship with cell diameter (Figure 1—figure supplement 1A,B). This is consistent with a previous study that demonstrated that vacuole volume correlates with cell volume (Chan and Marshall, 2014). Notably, we found that in the vac17Δ mutant, the vacuoles grew prior to the generation of a bud (Figure 1B, black arrow). In unbudded new daughters of the vac17Δ mutant, the vacuole diameter relative to cell diameter was smaller than that of wild-type and vac17Δ unbudded old mother cells (Figure 1B, left panel). Notably, the average diameter of the vacuole was only 5.7(±1.5)% of the cell diameter in new unbudded vac17Δ cells. However, after production of a small bud, the average mother cell vacuole diameter was 10(±3.8)% of the cell diameter. In contrast, there was no significant increase in the relative percent diameter of the vacuoles in wild-type and vac17Δ old mother cells with or without a small bud. These observations show that the vacuoles in the new daughter cells grow to a minimum size prior to producing a bud. This growth occurs either because a minimum vacuole size is required and/or because the vacuole needs to mature prior to the generation of a bud. Note that the vacuoles in vac17Δ new mothers continued to grow, and grew faster than vacuoles in either wild-type or vac17Δ old mother cells (Figure 1—figure supplement 1C, green line vs the black/pink lines). These observations suggest that cells actively synthesize new vacuoles in the absence of inherited vacuoles, and further suggest that there are mechanisms that regulate vacuole size in proportion to cell size. In addition, the average vacuole diameter relative to cell diameter of all the vac17Δ old mother cells was larger than that of wild-type and vac17Δ new mother cells (Figure 1—figure supplement 1D). This suggests that vacuole inheritance is also important for regulating vacuole size in the mother cell. We observed that all vac17Δ mother cells and unbudded cells have a vacuole as defined by the presence of Vph1-GFP. This strongly suggests that the vacuole is required for cell growth and viability. If this were true, then a combination of a vacuole inheritance defect with an additional defect in the synthesis of a new vacuole would render the cell inviable. Similarly, an additional defect in vacuole function(s) that are required for bud emergence would result in non-viable cells (Figure 2A). Indeed, a high-throughput screen suggested that over twenty genes might be synthetically lethal with the vac17Δ mutant (Costanzo et al., 2010). We individually tested double mutants of vac17Δ with each of the previously proposed candidates that are not essential genes, and found that the double mutants, vac17Δ pep12Δ and vac17Δ vps45Δ displayed synthetic growth defects (Figure 2B,C). Importantly pep12Δ and vps45Δ were also synthetically lethal with additional mutants defective in vacuole inheritance, vac8Δ and myo2-N1304D mutants (Figure 2—figure supplement 1A–D). The corresponding wild-type genes, PEP12 and VPS45, likely play a critical role in the generation of a new vacuole. Pep12 and Vps45 are required for the synthesis of a new vacuole. (A) Schematic of pathways predicted to exhibit synthetic lethality with mutations in vacuole inheritance. When vacuole inheritance is defective, the bud generates a new vacuole that is independent of the mother vacuole. If vacuoles play an essential role, then cells with no mechanism to generate a vacuole will not be viable. Furthermore if the new vacuole is defective in its essential function(s), the cell will not be viable. (B) The pep12Δ and vps45Δ mutants exhibit a synthetic growth defect with vac17Δ. Results of tetrad dissection. Haploid colonies from tetrads derived from heterozygous diploids of VAC17/vac17Δ PEP12/pep12Δ and VAC17/vac17Δ VPS45/vps45Δ were arrayed vertically on YPD (rich medium) plates incubated at 24°C for 3 days. vac17Δ = 17Δ; pep12Δ = 12Δ; vps45Δ = 45Δ; vac17Δ pep12Δ or vac17Δ vps45Δ double mutant = ΔΔ are indicated. (C) Quantification of colony size, relative to the average of wild-type colonies. A total of 28 full tetrads and 48 full tetrads were analyzed for vac17Δ pep12Δ and vac17Δ vps45Δ, respectively. Average size in each genotype (red bar). Error bar; SD. (D) Both vacuole inheritance and new synthesis are important to maintain functional vacuoles. In the vac17Δ pep12Δ mutant several cells appear to lack a vacuole. Wild-type cells incubated with 10 μM CMAC for 30 min exhibited a blue fluorescent signal in the vacuole lumen. The limiting membrane of the vacuole is indicated by Vph1-GFP expressed from its endogenous locus. Wild-type and vac17Δ cells show normal localization of Vph1-GFP and CMAC. Single pep12Δ cells show abnormal distribution in Vph1-GFP, but not CMAC. The vac17Δ pep12Δ double mutant cells show defects in the localization of Vph1-GFP and CMAC. (E) Quantification of cells with a CMAC positive subcellular structure. Any CMAC containing structure with or without Vph1-GFP was scored as a structure. Error bars; SD calculated from four independent experiments with at least 100 cells counted in each strain/experiment. (F) New vacuoles are generated from Pep12-positive endosomes. GFP-Pep12/Vph1-CFP expressed in wild-type and vac17Δcells were pulse labeled with FM4-64. GFP-Pep12 and Vph1-CFP were expressed from the endogenous loci in both strains. Open arrowheads; new vacuoles. (G) Quantification of percent daughter cells with Vph1-CFP and/or GFP-Pep12 in vac17Δ cells. Averages from two independent experiments; at least 100 cells counted per experiment. Open circles and triangles indicate each experiment. PEP12 encodes a t-SNARE, and VPS45 encodes a Sec1/Munc18 protein. These proteins function together in the vacuole-protein-sorting pathway from endosomes to the vacuole (Becherer et al., 1996; Burd et al., 1997). To test whether the growth defects of the vac17Δ pep12Δ double mutant are due to a defect in forming new vacuoles, we monitored vacuoles using two markers, Vph1-GFP and CMAC, a small molecule that is taken into the lumen of the vacuole (Stefan and Blumer, 1999). Wild-type and vac17Δ cells showed normal localization of Vph1-GFP and CMAC (Figure 2D,E). 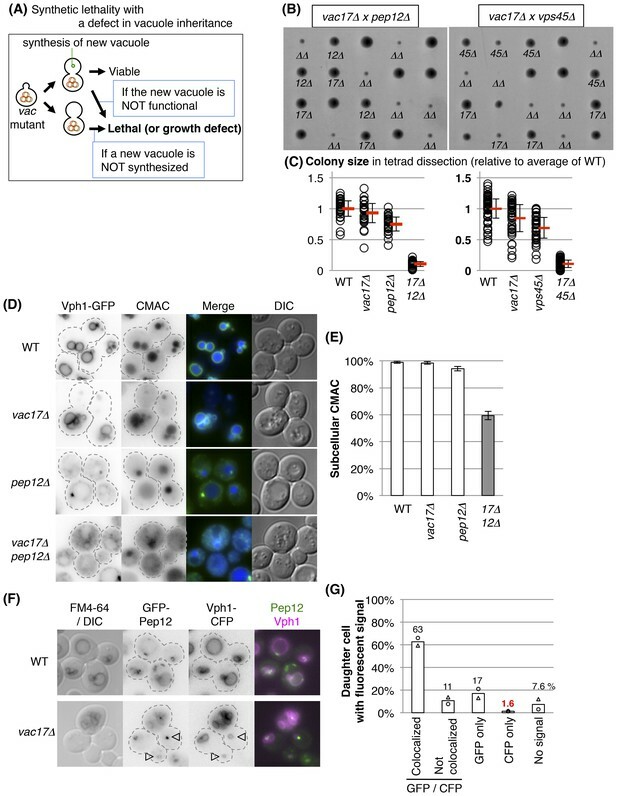 However, single pep12Δ cells, which have a defect in protein sorting to the vacuole, and a partial defect in vacuole inheritance (Raymond et al., 1992), showed an abnormal distribution of Vph1 (Piper et al., 1997), but not CMAC (Figure 2D,E). The vac17Δ pep12Δ double mutant cells showed defects in the localization of Vph1 and CMAC (Figure 2D,E). These findings suggest that the double mutant does not generate normal vacuoles. PEP12 localization is consistent with its role in the synthesis of a new vacuole. GFP-Pep12 and Vph1-CFP were co-expressed in a vac17Δ mutant labeled with FM4-64. In this strain, 63% of vac17Δ cells had GFP-Pep12 on the newly synthesized vacuole in the bud, which was Vph1-CFP positive but lacked FM4-64 (Figure 2F,G). In 17% of daughter cells, GFP-Pep12 was present in buds without a vacuole, as indicated by the absence of Vph1-CFP (vacuole). This suggests that a Pep12-positive endosome appears first, and subsequently a Vph1-positive vacuole matures from the Pep12-positive endosome. Note that in only 1.6% of cells, Vph1-CFP was present without GFP-Pep12. That the vacuole in the mother cell must reach a specific size prior to bud emergence (Figure 1B) and that a vacuole is required for cell growth (Figure 2), raised the possibility that the vacuole is required for cell-cycle progression. Thus, we tested whether the vac17 pep12 double mutant arrests at a specific point in the cell-cycle. To perform this analysis, we used the pep12-60tsf mutant, which is temperature sensitive for function (tsf). At elevated temperatures PEP12 function is acutely ablated, but the cells remain viable (Burd et al., 1997). Importantly, the vac17Δ pep12-60tsf double mutant, but not pep12-60tsf single mutant, showed a severe growth defect at 37°C (Figure 3A). The vacuole is required for cell-cycle progression from early G1. (A) The vac17Δ pep12-60tsf double mutant shows synthetic growth defects at the restrictive temperature, 37°C. Wild-type, vac17Δ, pep12-60tsf and vac17Δ pep12-60tsf strains were cultured in liquid media and serial dilutions were spotted onto YPD plates. The plates were incubated at 24°C, 30°C and 37°C for 2 days. (B) The vac17Δ pep12-60tsf double mutant arrests in G1 phase at the restrictive temperature 37°C. Percent cells in G1 phase (solid lines). Yeast strains tested; wild-type, vac17Δ, pep12-60tsf, and vac17Δ pep12-60tsf. Cultures were incubated at 24°C overnight, and then sifted to 37°C for 0, 2, 4, 8, 12, or 24 hr. The percentage of G1 cells (1N DNA) was measured using propidium iodide (PI) staining and assessed by flow cytometry. The same cultures were analyzed for lethality (percent dead cells) (dashed lines). After incubation at 37°C, the number of yeast cells were assessed with a hemocytometer, and their ability to form colonies at 24°C on YPD plates was tested. Lethality was inferred from the number of cells that survived the treatment. Error bars; SD calculated from four independent experiments. *** (p-value < 1 × 10−3). (C) The vac17Δ pep12-60tsf double mutant arrests in early G1 phase at the restrictive temperature 37°C. Cells were scored for the presence of Whi5-3xGFP in the nucleus. Wild-type, vac17Δ, pep12-60tsf, and vac17Δ pep12-60tsf cells, which express Whi5-3xGFP from its endogenous locus, were incubated at 24°C overnight, and then sifted to 37°C for 0 or 4 hr. Error bars; SD calculated from three independent experiments with at least 100 cells counted in each strain/experiment. *** (p-value < 1 × 10−3). (D) Arrested cells that have 1N DNA content are unbudded. Wild-type and vac17Δ pep12-60tsf cells were incubated at 24°C overnight, and then sifted to 37°C for 24 hr. After fixation, yeast were stained with PI, and cells with 1N DNA were sorted by flow cytometry. The sorted cells were observed by microscopy. For both wild-type and the vac17Δ pep12-60tsf double mutant 99% of the cells with 1N DNA were unbudded. Sorted cells from three individual experiments were counted. At least 400 cells were counted for each experiment. To test cell-cycle progression, we labeled DNA with propidium iodide (PI), and measured DNA content via FACS analysis. Wild-type, vac17Δ, pep12-60tsf, and vac17Δ pep12-60tsf cells were incubated overnight at 24°C, then shifted to 37°C. At 24°C (0 hr of 37°C), the vac17Δ pep12-60tsf double mutant had a normal cell-cycle profile (Figure 3B and Figure 3—figure supplement 1A). After incubation at 37°C for 24 hr, wild-type, vac17Δ and pep12-60tsf showed a similar percent of G1 phase cells (1N DNA); 46(±2)%, 48(±2)%, and 43(±3)%, respectively (Figure 3B and Figure 3—figure supplement 1A). In contrast, after incubation at the restrictive temperature for 24 hr, 80(±3)% of the vac17Δ pep12-60tsf double mutant cells arrested at G1 phase (1N DNA). Importantly, at 8, 12 and 24 hr after the shift to 37°C, the differences between the vac17Δ pep12-60tsf double mutant and the other strains were statistically significant (all p-values < 1 × 10−3). Consistent with these findings, both the vac17Δ pep12Δ and vac17Δ vps45Δ double mutants exhibited an arrest in G1 phase (Figure 3—figure supplements 1B,C). These results strongly suggest that a functional vacuole is important for cell-cycle progression from G1 phase. The finding that the vac17Δ pep12-60tsf double mutant arrests in G1 phase, suggested that this might be the primary reason for the growth arrest (Figure 3A). To further test this hypothesis, we monitored cell viability at several time points following a shift to 37°C. Cells were counted with a hemocytometer, and the ability of these cells to form colonies at 24°C was assessed (Figure 3B). There was a measurable increase in the lethality of the vac17Δ pep12-60tsf mutant. However the difference between the lethality of the pep12-60tsf single mutant and the vac17Δ pep12-60tsf double mutant was not statistically significant (p = 0.082) (Figure 3B). Together, these observations strongly suggest that cells without a functional vacuole arrest at G1 phase, and that this arrest is not an artifact of general cell death. 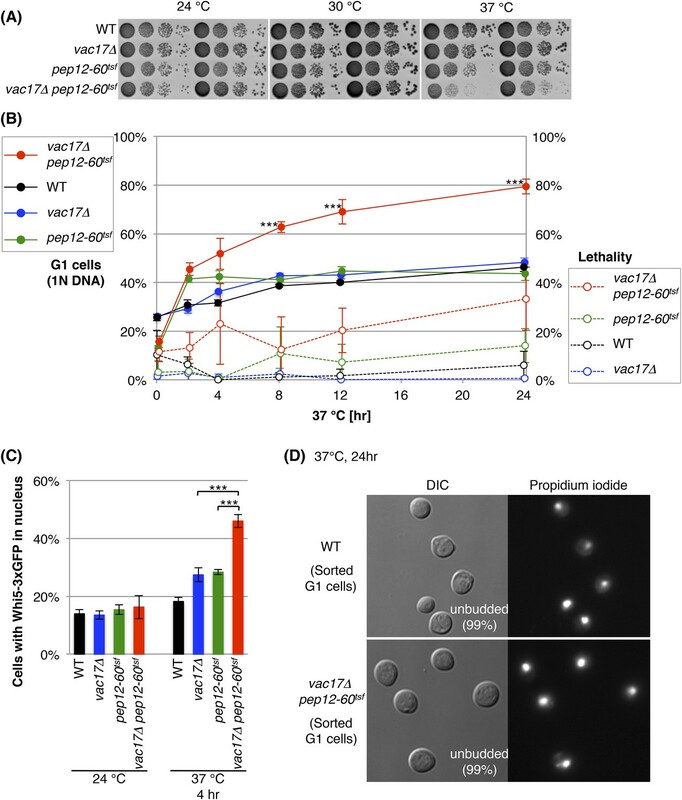 Additional evidence for a specific arrest in G1 phase, came from the finding that when the vac17Δ pep12-60tsf mutant was incubated at the restrictive temperature, there was a striking increase of cells with Whi5 in the nucleus (Figure 3C and Figure 3—figure supplement 1D). Whi5 is a transcriptional repressor of the SBF complex (Swi4-Swi6), and is localized in the nucleus in early G1 phase (Costanzo et al., 2004; de Bruin et al., 2004). In wild-type cells, Whi5 nuclear localization is transient and released by Cdc28-Cln3 activity, which enables progression to early G1 phase. Further evidence that this is a bona fide G1 arrest, came from the finding that the vac17Δ pep12-60tsf mutant with 1N DNA content, arrests as unbudded cells. We collected 1N DNA cells by flow cytometry, and determined their morphology by microscopy. After incubation at 37°C for 24 hr, 99% of the G1 cells were unbudded, in both the wild-type and vac17Δ pep12-60tsf mutant (Figure 3D). Together these results indicate that the vacuole is required for early G1 progression. The above findings predict that regulation of the cell-cycle requires signaling from the vacuole. Evidence for a candidate signaling pathway came from studies which showed that deletion of Target Of Rapamycin 1 (TOR1) showed synthetic growth defects with vac17Δ and vac8Δ (Zurita-Martinez et al., 2007; Costanzo et al., 2010) (Figure 4—fiugre supplements 1A,B). Similarly, another vacuole inheritance mutant, myo2-N1304D, was synthetic lethal with tor1Δ (Figure 4—figure supplement 1C). Notably, the vac17Δ tor1Δ double mutant showed an increase in cells arrested at G1 phase (Figure 4A,B). This arrest in G1 phase was similar to that observed for the vac17Δ pep12-60tsf and vac17Δ pep12Δ mutants (Figure 3—figure supplements 1A–C). This suggests that TORC1 signaling from the vacuole may account at least in part for the G1 arrest observed in the vac17Δ pep12-60tsf and vac17Δ pep12Δ mutants. Interestingly, the vac17Δ tor1Δ mutants generated a new vacuole in the daughter cells (Figure 4C). This suggests that TOR1 functions after the synthesis of the new vacuole. TORC1-SCH9 signaling from the new vacuole is required for cell-cycle progression. (A) The vac17Δ tor1Δ double mutant exhibits an accumulation of G1 phase cells. Flow cytometry analysis with PI staining of yeast strains; wild-type, vac17Δ, tor1Δ, and vac17Δ tor1Δ. (B) Quantification of percent cells in G1 and G2 phase. Error bars; SD calculated from four independent experiments. (C) A new vacuole is synthesized in the new daughter cells of the vac17Δ tor1Δ double mutant. Wild-type, vac17Δ, tor1Δ, and vac17Δ tor1Δ cells which express Vph1-GFP from its endogenous locus, were pulse labeled with FM4-64. Arrowheads; new vacuole in daughter cells. (D) The kinase activity of target of rapamycin 1 (Tor1) is required for growth of the vacuole inheritance mutant, vac17Δ. Plasmids were transformed into a vac17Δ tor1Δ mutant containing pRS416 [URA3] TOR1. Plasmids tested were pRS315 [LEU2] (mock), pRS315 HA-TOR1, pRS315 HA-tor1-D2275A, or pRS315 HA-tor1-D2294E. Transformed colonies were cultured in liquid media and serial dilutions spotted onto SC+5-FOA or SC-Leu-Ura plates. Plates were incubated at 24°C for 4 days. (E) TORC1 signals from the new vacuole via Sch9. The phospho-mimetic sch9-2D3E mutant partially rescues the growth defect of the vac17Δ tor1Δ mutant. pRS413 (mock), pRS413 VAC17, pRS413 TOR1, pVT102-H (mock), pVT102-H SCH9, pVT102-H sch9-2D3E, or pVT102-H sch9-5A expressed in vac17Δ tor1Δ with pRS416 TOR1. Transformed colonies were cultured in liquid media and serial dilutions were spotted onto SC-His+5-FOA or SC-His-Ura plates, and incubated at 24°C for 4 days. (F) Sch9 signaling requires a functional vacuole. The phospho-mimetic sch9-2D3E mutant does not rescue the growth defect of the vac17Δ pep12Δ mutant. pRS413 (mock), pRS413 VAC17, pRS413 TOR1, pVT102-H (mock), pVT102-H SCH9, pVT102-H sch9-2D3E, or pVT102-H sch9-5A plasmids were expressed in a vac17Δ pep12Δ strain. Transformed colonies were cultured in liquid media and serial dilutions spotted onto an SC-His plate, and incubated at 24°C for 3 to 4 days. TOR1 encodes a PIK-related protein kinase (Alarcon et al., 1999). In yeast, Tor1 functions in the TORC1 complex, which is composed of Tor1/2, Kog1, Lst8, and Tco89 (Loewith et al., 2002). In yeast, TORC1 localizes on the vacuole membrane (Reinke et al., 2004; Araki et al., 2005; Urban et al., 2007; Sturgill et al., 2008; Binda et al., 2009; Jin et al., 2014), and is a key determinant of nutrient status (Di Como and Arndt, 1996). We found that the kinase activity of Tor1 was required for growth of vac17Δ (Figure 4D), and that the TORC1 specific subunit KOG1 was also required for growth of vac17Δ (Figure 4—figure supplement 1D). In addition, the lst8-15 temperature sensitive mutant is also synthetically lethal with vac17Δ (Costanzo et al., 2010). These results suggest that the kinase activity of the TORC1 complex is required for normal growth of vacuole inheritance mutants. One critical target of TORC1 is the Sch9 kinase, which shares overlapping functions with metazoan S6 kinase (Ballou et al., 1991; Oldham et al., 2000; Christie et al., 2002). TORC1 directly phosphorylates Sch9 on several serines and threonines, and the phospho-mimetic sch9-2D3E, but not wild-type SCH9 or the Ala-substituted sch9-5A mutant bypasses the TORC1 inhibitor, rapamycin (Loewith et al., 2002; Urban et al., 2007). Notably, the phospho-mimetic sch9-2D3E mutant partially suppressed the growth defect of the vac17Δ tor1Δ mutant (Figure 4E), suggesting that the arrest of this mutant is due in part to defects in TORC1 mediated signaling via SCH9. It was previously shown that Sch9-2D3E localizes on the vacuole membrane (Urban et al., 2007). To test whether bypass of Tor1 by sch9-2D3E requires a functional vacuole, we tested whether sch9-2D3E can suppress the vac17Δ pep12Δ double mutant. Notably sch9-2D3E did not suppress the vac17Δ pep12Δ double mutant (Figure 4F). This suggests that a functional vacuole is required for the roles of the TORC1-SCH9 pathway in cell-cycle progression from G1 phase. While previous studies showed that TORC1 signals from the vacuole/lysosome (Sancak et al., 2010), and that Sch9 is activated in that location (Urban et al., 2007), it was assumed that once Sch9 is activated, it no longer requires the vacuole for its further downstream functions. However our findings strongly suggest that the vacuole is required for Sch9 function(s) after Sch9 is phosphorylated by TORC1. One possible role of the vacuole in Sch9 function, is that target protein(s) of the Sch9 kinase must be present on the vacuole membrane. Alternatively or in addition, the full kinase activity of Sch9 may require other proteins that are on the vacuole membrane. If a cell does not receive a vacuole from the mother cell, the daughter cell generates a new vacuole. The observation that these new vacuoles grow to a specific size prior to generation of a bud, and that TORC1 signaling is also required, raised the possibility that that there are functional differences between newly synthesized vacuoles and inherited vacuoles. As a first approach, we tested the localization of several proteins that are involved in the TORC1 pathway, Tor1, Kog1 and Sch9. New vacuoles were defined as Vph1-CFP positive structures that failed to inherit FM4-64. Notably, in vac17Δ cells, GFP-Sch9 was defective in its localization to the new vacuoles, while the localization of Tor1 and Kog1 were unaffected (Figure 5A,B). To directly address whether Sch9 is eventually recruited to the newly formed vacuole and when this occurs, we correlated the presence of fluorescent signals for Vph1-CFP, Tor1-3xGFP and GFP-Sch9 (Figure 5C,D). These analyses show that Sch9 recruitment to the newly formed vacuole is slower than the recruitment of Vph1 and Tor1. Specifically, small budded cells did not have fluorescent signals for any of the proteins, which indicates that these small buds do not have a vacuole (Figure 5C–F). As the bud increases in size, in most cases, Vph1-CFP and Tor1-3xGFP appeared simultaneously (Figure 5C). This indicates that Tor1-3xGFP is immediately recruited to the newly formed vacuoles. Moreover in some small budded cells, Tor1-3xGFP was present without Vph1-CFP, which suggests that Tor1 may be present at endosomes in these small budded cells. The newly synthesized vacuoles initially lack Sch9 and Fab1. (A) Sch9 does not localize to the newly formed vacuole. Indicated plasmids were transformed into wild-type and vac17Δ strains, which express Vph1-CFP from its endogenous locus: pRS416 GFP-SCH9, pRS416 TOR1-3xGFP(D330), or pRS416 KOG1-3xGFP. Transformed cells were pulse labeled with FM4-64. Open arrowheads indicate a newly formed vacuole (Vph1-CFP) that was not inherited (lack of FM4-64), and is lacking GFP-Sch9. Closed arrowheads indicate a newly formed vacuole (Vph1-CFP) that was not inherited (lack of FM4-64), and with the GFP fusion protein, either Tor1-3xGFP(D330) or Kog1-3xGFP. (B) Quantification of cells with fluorescence (Vph1-CFP and/or GFP) in daughter cells, where the mother has both GFP and FM4-64 signals. Averages from two independent experiments, with n = 69 and n = 104 for GFP-Sch9, n = 166 and n = 110 for Tor1-3xGFP(D330), and n = 106 and n = 126 cells for Kog1-3xGFP, respectively. Open circles and squares indicate results of each experiment. (C) Tor1 is immediately recruited to the newly formed vacuoles. FM4-64 labeled vac17Δ cells that express Vph1-CFP from its endogenous locus, and Tor1-3xGFP expressed from a CEN plasmid with its endogenous promoter were used. Most small budded cells do not have fluorescent signals for any of the proteins, indicating that these small buds do not have a vacuole. In most cases, as the bud increases in size, Vph1-CFP and Tor1-3xGFP appear simultaneously. The middle line in the box plot indicates the median of the data set. The upper edge of the box indicates the 75th percentile of the data set, and the lower edge indicates the 25th percentile. ns; not a significant difference (p-value > 0.10); *** (p-value < 1 × 10−6). (D) Sch9 recruitment is delayed compared to Tor1, but eventually occurs. FM4-64 labeled vac17Δ cells expresses Vph1-CFP from its endogenous locus, and GFP-Sch9 expressed from a CEN plasmid with its endogenous promoter were used. In medium sized buds (0.62(±0.14) daughter size/mother size) only Vph1-CFP is present. The average bud size where both Vph1 and Sch9 are present is 0.79(±0.11). (E) Recruitment of Sch9-2D3E to the new vacuole is similar to the recruitment of wild-type Sch9. FM4-64 labeled vac17Δ cells which express Vph1-CFP from its endogenous locus, and GFP-Sch9-2D3E expressed from a CEN plasmid with its endogenous promoter were used. (F) The timing of the recruitment of Fab1 was similar to that observed for Sch9. FM4-64 labeled vac17Δ cells which express Vph1-CFP from its endogenous locus, and Fab1-3xGFP expressed from a CEN plasmid with its endogenous promoter were used. In medium sized buds (0.57(±0.13) daughter size/mother size) only Vph1-CFP is present. The average bud size where both Vph1 and Fab1 are present is 0.76(±0.10). (G) Model: The vacuole is essential for cell-cycle progression and functions in part through the TORC1 pathway. When the daughter cell receives vacuoles from the mother cell(1), the daughter can progress from G1. If the cell fails to inherit a vacuole(2), the cell generates a new vacuole(3), which is followed by maturation of the new vacuole prior to G1 progression(4). Without a functional vacuole, the daughter cell arrests at G1 phase(5). In the vac17Δ mutant, although Tor1-3xGFP and Vph1-CFP are both present on the new vacuoles in medium buds (approximately 0.6 daughter size/mother size) (Figure 5C), GFP-Sch9 was generally not present until the bud size was larger (approximately 0.8) (Figure 5D). Thus Sch9 recruitment is delayed compared to Vph1 and Tor1, but eventually occurs. Notably the recruitment of the Sch9-2D3E mutant was similar to the recruitment of wild-type Sch9 (Figure 5E), indicating that the growth suppression of the vac17Δ tor1Δ mutant by sch9-2D3E is not due to a faster recruitment to the vacuole. PI(3,5)P2, an inositol lipid which is present at the vacuole membrane, is required for vacuole membrane targeting of Sch9 (Jin et al., 2014). To test whether the delay in Sch9 recruitment might be due to a delay in the generation of PI(3,5)P2 on newly formed vacuoles, we tested the timing of the recruitment of Fab1, the sole lipid kinase that generates PI(3,5)P2 (Gary et al., 1998). Notably the timing of the recruitment of Fab1 was similar to that observed for Sch9. In a vac17Δ mutant which co-expressed Vph1-CFP and Fab1-3xGFP, only Vph1-CFP is present in medium buds (approximately 0.6 daughter size/mother size) (Figure 5F). The average bud size where both Vph1 and Fab1 are present was 0.76(±0.10). Thus Fab1 recruitment is delayed compared to Tor1, but is similar to that observed for Sch9. These observations suggest that there are differences between new vacuoles and inherited vacuoles, and that the newly synthesized vacuoles are missing specific components of mature vacuoles that are essential for cell-cycle progression. Together, these observations demonstrate that a functional vacuole is crucial for cell-cycle progression at G1 phase, and that the TORC1-SCH9 pathway is part of this critical function (Figure 4G). TORC1-SCH9 signaling from the vacuole may be involved in G1 progression through its known functions in a ribosome biogenesis and translation (Barbet et al., 1996; Jorgensen et al., 2004; Urban et al., 2007). Alternatively, the TORC1-SCH9 pathway may signal the cell-cycle machinery that a functional vacuole is present and hence the cell is ready to progress from G1. Previous studies showed that Sch9 activity is critical for cell size (Jorgensen et al., 2004; Urban et al., 2007), and that cell size correlates with vacuole size (Chan and Marshall, 2014). These observations together with the current study suggest that TORC1-SCH9 localization and signaling from the vacuole is critical for the regulation of cell size. It is tempting to speculate that an analogous regulation of the cell-cycle occurs from endo-lysosomal membranes in other organisms. In addition, these findings lead to the hypothesis that cells possess novel checkpoint mechanisms that prevent cell-cycle progression at G1 phase in the absence of essential organelles. Yeast strains used are in Table 1. Deletion and fusion strains were constructed as described (Longtine et al., 1998). A vac17Δ pep12-60tsf double mutant strain was made through mating pep12-60tsf (CBY9) (Burd et al., 1997) with vac17Δ (LWY5798) (Ishikawa et al., 2003). To generate a GFP-PEP12::natNT2 strain, a ClaI-ApaI fragment from pBlueScript SK+ (pBS) GFP-PEP12::natNT2 vector was integrated into the PEP12 locus. Yeast cultures were grown at 24°C unless stated otherwise. Yeast extract-peptone-dextrose (1% yeast extract, 2% peptone, 2% dextrose; YEPD), synthetic complete (SC) lacking the appropriate supplement(s), and 5-FOA media were made as described (Kaiser et al., 1994). Unless stated otherwise, SC medium contained 2% dextrose. Each above haploid strain is ura3-52, leu2-3,-112, his3-Δ200, trp1-Δ901, lys2-801, suc2-Δ9, and diploid strain is ura3-52/ura3-52, leu2-3,-112/leu2-3,-112, his3-Δ200/his3-Δ200, trp1-Δ901/trp1-Δ901, lys2-801/lys2-801, suc2-Δ9/suc2-Δ9. Vacuoles were labeled in vivo with N-(3-triethelammoniumpropyl)-4-(6 (4-(diethylamino) phenyl) hexatrienyl) pyridinium dibromide (FM4-64 [SynaptoRed C2]; Biotium, Hayward, CA, United States) essentially as described (Ishikawa et al., 2003). In brief, a 2 mg/ml stock solution of FM4-64 in dimethyl sulfoxide was added to early log phase cultures for a final concentration of 80 μM. After 1 hr of labeling, cells were washed and then chased in fresh liquid medium for 3–4 hr. Plasmids used are in Table 2. To generate an integration vector to express GFP fused to Pep12 from the PEP12 gene locus, pBS GFP-PEP12::natNT2 was made. A 1.4 kb ClaI-BstBI fragment of PEP12 was inserted at the ClaI site of pBS. To insert GFP at the N-terminus of Pep12, an AvrII site was generated at the N-terminus of PEP12 by PCR using primers (5′-CAA TAA TTG TGT TGA GAT Gcc tag gTC GGA AGA CGA ATT TTT TGG-3′) and (5′-CCA AAA AAT TCG TCT TCC GAc cta ggC ATC TCA ACA CAA TTA TTG-3′). The GFP fragment was amplified from pFA6a GFP(S65T)-KanMX (Longtine et al., 1998) by PCR using primers (5′-TGA gct agc AGT AAA GGA GAA GAA CTT TTC ACT GG-3′) and (5′-TGA act agt gtt aat taa ccc ggg gat ccg tcg acc TTT GTA TAG TTC ATC CAT GCC-3′). The NheI-SpeI fragment of GFP was inserted at the AvrII site. The natNT2 maker was amplified from pFA6a natNT2 (Janke et al., 2004) by PCR using primers (5′-CTG tgt aca CAG CGA CAT GGA GGC-3′) and (5′-TCA tgt aca ACA GGT GTT GTC CTC TGA G-3′). A BsrGI fragment of natNT2 was inserted into the BsrGI site at 3′ UTR of the PEP12. pRS416 TOR1 includes 227 bp upstream and 944 bp downstream of the TOR1 gene, the same region as pRS315 HA-TOR1 (gift from Dr Robbie Loewith). For generation of tor1-D2275A, and -D2294E kinase dead mutants (Zheng et al., 1995; Alarcon et al., 1999), the TOR1 gene was mutagenized by site-directed mutagenesis using the following primers: (D2275A-S) 5′-GTT ATA TTC TGG GAC TAG GTG cTC GCC ATC CAA GCA ACC TG-3′, (D2275A-AS) 5′-CAG GTT GCT TGG ATG GCG AgC ACC TAG TCC CAG AAT ATA AC-3′, (D2294E-S) 5′-CAC CGG TAA AGT TAT CCA CAT TGA aTT CGG CGA TTG TTT TGA AGC-3′, (D2294E-AS) 5′-GCT TCA AAA CAA TCG CCG AAt TCA ATG TGG ATA ACT TTA CCG GTG-3′. For generation of pVT102-H SCH9, SCH9 was amplified by PCR using primers (5′-ATA gga tcc ATG ATG AAT TTT TTT ACA TCA AAA TCG-3′) and (5′-GAG tct aga TAT TTC GAA TCT TCC ACT GAC AAA TTC-3′). A BamHI-XbaI fragment of SCH9 was inserted into the BamHI, XbaI sites of pVT102-H (Vernet et al., 1987). For generation of phospho-mimetic sch9-2D3E and non-phospho sch9-5A mutant (Urban et al., 2007), the SCH9 gene was mutagenized by site-directed mutagenesis using the following primers: (T723D/S726D-S) 5′-CC GAT GAT GAC TGC Tga CCC GCT Aga TCC AGC CAT GCA AGC AAA G-3′, (T723D/S726D-AS) 5′-CTT TGC TTG CAT GGC TGG Atc TAG CGG Gtc AGC AGT CAT CAT CGG-3′, (T737E–S) 5′-CAA GCA AAG TTT GCT GGT TTC gaa TTT GTT GAT GAG TCC GCC ATC-3′, (T737E-AS) 5′-GAT GGC GGA CTC ATC AAC AAA ttc GAA ACC AGC AAA CTT TGC TTG-3′, (S758E/S765E–S) 5′-CCT ACA AAA Cga GTA CTT TAT GGA ACC TGG Tga aTT TAT CCC GGG-3′, (S758E/S765E-AS) 5′-CCC GGG ATA AAt tcA CCA GGT TCC ATA AAG TAC tcG TTT TGT AGG-3′, (T723A/S726A-S) 5′-CCG ATG ATG ACT GCT gCC CCG CTA gCT CCA GCC ATG CAA GCA AAG-3′, (T723A/S726A-AS) 5′-CTT TGC TTG CAT GGC TGG AGc TAG CGG GGc AGC AGT CAT CAT CGG-3′, (T737A-S) 5′-CAA GCA AAG TTT GCT GGT TTC gCC TTT GTT GAT GAG TCC GCC ATC-3′, (T737A-AS) 5′-GAT GGC GGA CTC ATC AAC AAA GGc GAA ACC AGC AAA CTT TGC TTG-3′, (S758A/S765A-S) 5′-CCT ACA AAA CgC GTA CTT TAT GGA ACC TGG TgC CTT TAT CCC GGG-3′, (S758A/S765A-AS) 5′-CCC GGG ATA AAG GcA CCA GGT TCC ATA AAG TAC GcG TTT TGT AGG-3′. For generation of pRS416 TOR1-3xGFP(D330), an XbaI site was generated at the D330 position of TOR1 with PCR using primers (5′-GTT TAT AAG GAA ATC TTG TTT TTG AAG tct Aga CCC TTT TTG AAT CAA GTG TTC-3′) and (5′-GAA CAC TTG ATT CAA AAA GGG tcT aga CTT CAA AAA CAA GAT TTC CTT ATA AAC-3′). A 3xGFP fragment was amplified from pFA6a 3xGFP-TRP1 by PCR using primers (5′-CGG tct aga GGG TTA ATT AAC GTG AGC AAG GG-3′) and (5′-AAT CTC GAG gct agc GGG GAT CCG TCG ACC CTT GTA CAG CTC GTC CAT GC-3′). An XbaI-NheI fragment of 3xGFP was inserted at the XbaI site (Jin et al., 2014). For generation of pRS416 KOG1-3xGFP, an XbaI site was generated at the C-terminal end of KOG1 by PCR using primers (5′-GAG AAT TGA TTA TTT Ttc tag aTA TGT GCC ATT TCT TTT TTT TTC-3′) and (5′-GAA AAA AAA AGA AAT GGC ACA TAt cta gaA AAA TAA TCA ATT CTC-3′). The 3xGFP fragment was amplified by PCR using primers (5′-TCT AGA GGG TTA ATT tct aga AGC AAG GGC GAG GAG C-3′) and (5′-AAT CTC GAG gct agc GTT AAT TAA CCC GGG GAT CCG TCG ACC-3′). The XbaI-NheI fragment of 3xGFP was inserted at the XbaI site (Jin et al., 2014). Quantitation of nuclear DNA was determined as follows: Cells were stained with PI and analyzed by FACS analysis (MACSQuant 1; Miltenyi Biotec, Germany). In most experiments, 10,000 cells were examined. Yeast were incubated at 24°C overnight, and then sifted to 37°C for 0, 2, 4, 8, 12, or 24 hr. At the start of the experiment, yeast were in log phase growth. 1.0 OD600 yeast cultures were collected, washed with 50 mM of Tris-HCl [pH7.5], and fixed with 70% EtOH. Cells were then washed twice with 50 mM of Tris-HCl [pH7.5], followed by sonication. Cells were treated with RNaseA (Sigma–Aldrich R6513; final 2 mg/ml in 50 mM of Tris-HCl [pH7.5]) at 37°C overnight. Cells were then treated with Pepsin (Sigma–Aldrich 7000; final 5 mg/ml) at room temperature for 30 min, and stained with PI (Sigma–Aldrich 4170) 50 mg/ml in 180 mM Tris-HCl [pH7.5], 180 mM NaCl, 70 mM MgCl2 for 1 hr at room temperature. The PI stained cells were analyzed by FACS. Molecular Biology of the Cell 10:2531–2546. Molecular Biology of the Cell 20:1592–1604. Genes & Genetic Systems 80:325–343. Molecular Biology of the Cell 7:25–42. Molecular Biology of the Cell 7:579–594. Molecular Biology of the Cell 15:3994–4002. Molecular and Cellular Biology 17:6847–6858. Microbiology and Molecular Biology Reviews 62:230–247. Molecular Biology of the Cell 8:1089–1104. The Journal of Cell Biology 150:513–526. Proceedings of the National Academy of Sciences of USA 95:14799–14804. The Journal of Biological Chemistry 277:9952–9957. The Journal of Cell Biology 198:69–85. The Journal of Cell Biology 186:541–554. Current Opinion in Microbiology 10:528–538. The Journal of Cell Biology 143:65–79. The Journal of Cell Biology 135:1535–1549. The Journal of Cell Biology 160:887–897. Molecular and Cellular Biology 22:7744–7757. Molecular Biology of the Cell 25:1171–1185. Molecular Biology of the Cell 20:1312–1323. Cold Spring harbor, New York, USA: Cold Spring Harbor Laboratory Press. Molecular Biology of the Cell 19:4177–4187. Molecular Biology and Evolution 29:975–984. Molecular Biology of the Cell 18:1187–1202. The Journal of Cell Biology 138:531–545. Molecular Biology of the Cell 3:1389–1402. The Journal of Biological Chemistry 279:14752–14762. Annual Review of Cell and Developmental Biology 18:379–420. The Journal of Biological Chemistry 274:1835–1841. The Journal of Cell Biology 140:1063–1074. Molecular Biology of the Cell 7:1375–1389. The Journal of Cell Biology 105:1539–1547. Proceedings of the National Academy of Sciences of USA 87:1076–1080. Thank you for submitting your work entitled “The vacuole/lysosome is required for cell-cycle progression” for peer review at eLife. Your submission has been favorably evaluated by Vivek Malhotra (Senior Editor) and three reviewers, one of whom is a member of our Board of Reviewing Editors. The reviewers found the idea of a checkpoint linking vacuole inheritance and/or biogenesis to the cell cycle potentially important. However, substantial discussion amongst the reviewers debated whether you have identified a bona fide cell growth checkpoint or simply confirmed that TORC1 signals from the vacuole membrane. It was appreciated that this may not be definitively distinguished at this stage and the reviewers have collectively offered a few experiments that they feel can raise the paper to the threshold of acceptance. 1) It wasn't clear from the data presented for the double mutants whether “G1 arrest” only refers to the DNA content, and whether these are unbudded cells or budded cells with unduplicated nuclei. This is an important distinction that needs to be resolved as it helps to form whether the signal is controlling multiple aspects of cell cycle coordination, or just one (i.e. chromosome duplication and/or cell growth and cytokinesis). Similarly, the authors state in the Results and Discussion section that: “These observations strongly suggest that cells without a functional vacuole first arrest at G1 phase, and then eventually die.” This and the aforementioned issue could be addressed by making movies with the double mutant (rather than simply taking static pictures) with the Vph1-GFP and a second tagged marker (e.g. nuclear). From the data presented this should be easy for the authors to do. 2) When is Sch9 recruited to a newly formed vacuole? Figure 5 shows that there is a defect or delay in Sch9 recruitment to the vacuole of vac17Δ cells, but does not reveal when during the process of vacuole biogenesis this problem is resolved or how this relates to eventual bud growth. Does Sch9-2D3E localize to the vacuole, or does it bypass TORC1 signaling altogether? The Weisman group has previously shown that PI(3,5)P2 on the vacuole membrane is required vacuole membrane targeting of Sch9 (Jin et al., 2014). 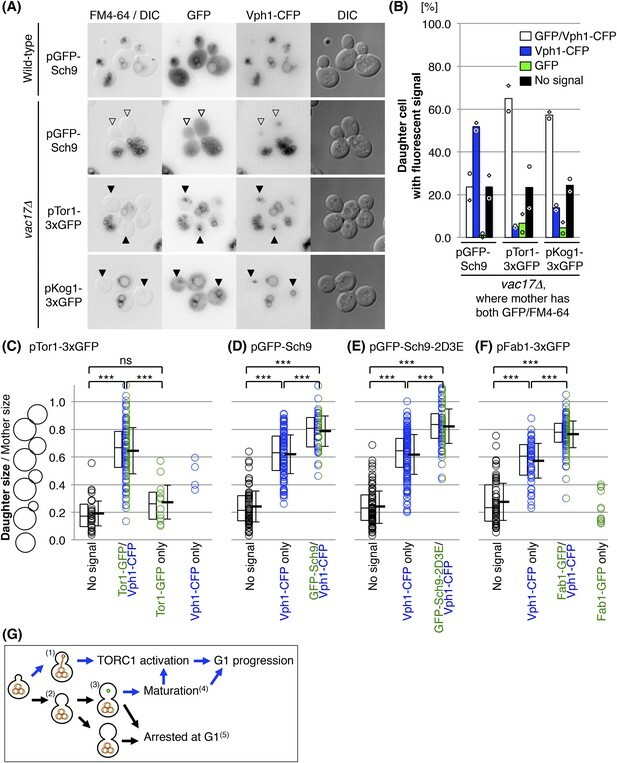 The difference between the ‘new’ and maternal vacuoles in sustaining TORC1 signaling (and, therefore, cell growth) may reflect the acquisition of PI(3,5)P2 on the new vacuole membrane. Does the ‘new’ vacuole in vac17 cells (Figure 4–figure supplement 1) contain PI(3,5)P2? It might also be informative to determine if synthetic targeting of Sch3-2D3E to the ‘old’ vacuole (e.g., by fusion to Vph1) rescue the cell growth defect? 3) The Barbet et al., MBoC, 1996 study (PMID: 8741837) on the role of Tor signaling in the regulation of cell cycle progression out of G1 should be cited and discussed. We tested and found that the vac17∆ pep12-60tsf mutant arrests with 1N DNA content as unbudded cells. This data is now shown in new Figure 3D and presented in the text as follows: “Further evidence that this is a bona fide G1 arrest, came from the finding that the vac17∆ pep12-60tsf mutant with 1N DNA content, arrests as unbudded cells. […] Together these results indicate that the vacuole is required for early G1 progression.” Note that at least 400 cells were counted for each experiment, and three independent experiments were performed (see Figure 3D legend). Similarly, the authors state: in the Results and Discussion section that: “These observations strongly suggest that cells without a functional vacuole first arrest at G1 phase, and then eventually die. This and the aforementioned issue could be addressed by making movies with the double mutant (rather than simply taking static pictures) with the Vph1-GFP and a second tagged marker (e.g. nuclear). From the data presented this should be easy for the authors to do. Based on these new analyses it did not appear essential to the current study to further analyze the relative timing of G1 arrest and cell death by performing movies of individual cells. In addition because the increase in cell death does not occur until at least 24 hr at 37°C, it would be difficult if not impossible to generate time-lapse movies of this length of individual fluorescently labeled cells of the vac17∆ pep12-60tsf double mutant, to determine whether all cells eventually die and to determine a time-course of cell death. 2) When is Sch9 recruited to a newly formed vacuole? Figure 5 shows that there is a defect or delay in Sch9 recruitment to the vacuole of vac17Δ cells, but does not reveal when during the process of vacuole biogenesis this problem is resolved or how this relates to eventual bud growth. We agree that this is a critical question. We showed there is less Sch9 on the newly formed vacuole in Figure 5. To directly address whether Sch9 is eventually recruited to the newly formed vacuole and when this occurs, we correlated the presence of fluorescent signals, for Vph1-CFP, Tor1-3xGFP and GFP-Sch9 (Figure 5C). This new analysis shows that Sch9 recruitment to the newly formed vacuole is slower than the recruitment of Vph1 and Tor1. Specifically, small budded cells do not have fluorescent signals for any of the proteins indicating these small buds do not have a vacuole. In most cases, as the bud increases in a size, Vph1-CFP and Tor1-GFP appear simultaneously. This indicates that Tor1-GFP is immediately recruited to the newly formed vacuoles. In contrast, in the vac17∆ mutant which co-expresses Vph1-CFP and GFP-Sch9, in medium sized buds (0.62(±0.14) daughter size/mother size) only Vph1-CFP is present. The average bud size where both Vph1 and Sch9 are present is 0.79(±0.11). Thus Sch9 recruitment is delayed compared to Tor1, but eventually occurs. Does Sch9-2D3E localize to the vacuole, or does it bypass TORC1 signaling altogether? We thank the reviewers for this suggestion. To test whether the delay in Sch9 recruitment might be due to a delay in the generation of PI(3,5)P2 on the newly formed vacuoles, we tested the timing of the recruitment of Fab1, the sole lipid kinase for generation of PI(3,5)P2. Notably the timing of the recruitment of Fab1 was similar to that observed for Sch9. In a vac17∆ mutant that co-expressed Vph1-CFP and Fab1-3xGFP, in medium sized buds (0.57(±0.13) daughter size/mother size) only Vph1-CFP is present. The average bud size where both Vph1 and Fab1 are present is 0.76(±0.10). Thus Fab1 recruitment is delayed compared to Tor1, and is similar to the recruitment of Sch9. “Together, these observations demonstrate that a functional vacuole is crucial for cell-cycle progression at G1 phase, and that the TORC1-SCH9 pathway is part of this critical function (Figure 4G). TORC1-SCH9 signaling from the vacuole may be involved in G1 progression through its known functions in a ribosome biogenesis and translation (Barbet et al., 1996; Jorgensen et al., 2004; Urban et al., 2007)”. We thank Drs Robbie Loewith (U of Geneva, Switzerland), Yoshiaki Kamada (National Institute for Basic Biology, Japan), and Scott Emr (Cornell University) for plasmids and yeasts. We thank Drs Yukiko Yamashita, John Kim (U of Michigan) and Bethany Strunk for helpful suggestions for the manuscript. We thank all members of the Weisman lab, especially Dr Natsuko Jin for help with the viability analyses and for discussions. We thank Emily Kauffman for technical assistance, and Steven Merz for measuring cell and vacuole diameters. We thank Dr Amy Ikui (Brooklyn College, CUNY) and the Flow Cytometry Core at the University of Michigan for FACS analysis. This work was supported by National Institutes of Health grant R37 GM062261 to LSW.